Well, you can't beat a good headline, and you really can't beat it when 50,000 people read the "RPA is dead. 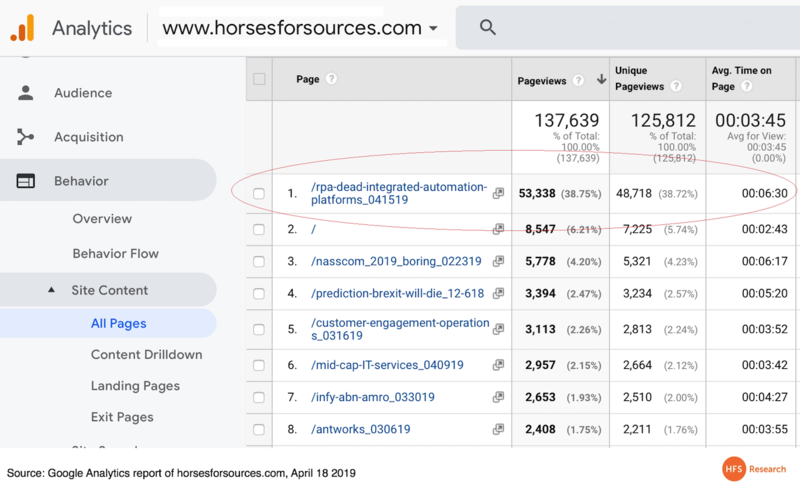 Long live Integrated Automation Platforms" blog article in just 48 hours, spending a whopping average of 6.5 minutes actually reading it. Yes, most of you made it further than the headline! So where do we all go from here? RPA as a term just doesn't make sense anymore, but these terrific brands will thrive as Robotic Transformation Software. We re-badge RPA as Robotic Transformation Software (RTS) because that’s what it is (or what aspires to be). Only a small portion of "RPA" is actually “process automation”... most of it is desktop apps, screen scrapes and document management fixes. Most “RPA” engagements that have been signed are not for unattended processes, instead, most are attended robotic desktop automation (RDA) deployments. Attended RDA requires a loop of human and bot interplay to complete tasks. These engagements are not the pure form of RPA that we invented back in 2012 – they are a motley crew of scripts and macros applying band-aids to messy desktop applications and processes to maintain the same old way of doing things. 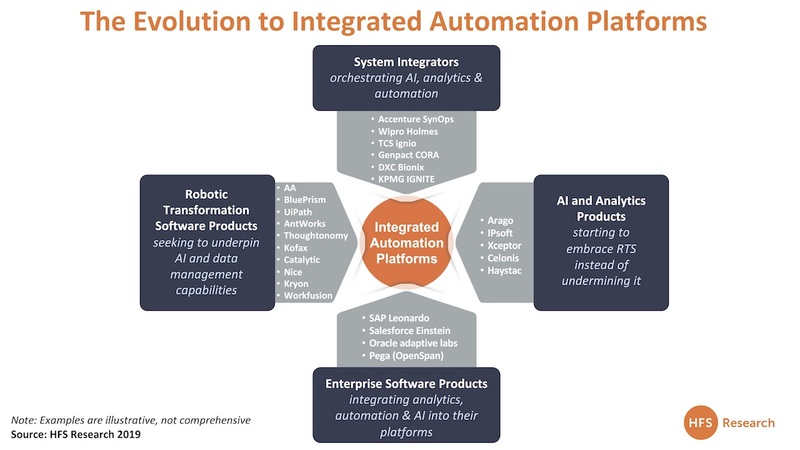 Integrated Automation Platforms are the Holy Automation Grail (HAG*) if we can make it there. Automation ultimately needs to support transformation, not legacy. The more these RTS tools can be leveraged by clients - not only to do things better and more automatically - but also to help them re-wire their operations to achieve their outcomes, then we have lift-off. These tools also need to make enterprises more agile - if you just work on steady-state fixes without focusing on how to make real changes down the road, we will see many enterprises stuck in legacy purgatory, unable to switch out bots in the future. Enter the concept of Robotic Process Automation (RPA), introduced to market in 2012 via a case study written by HFS and supported by Blue Prism, which promised to remove manual workarounds and headcount overload from inefficient business processes and BPO services. However, despite offering clear technical capability and the real advantage of breathing life into legacy systems and processes, RPA hasn’t inspired enterprises to rewire their business processes – it’s really just helped them move data around the company faster and require less manual intervention. In addition, most “RPA” engagements that have been signed are not for unattended processes, instead, most are attended robotic desktop automation (RDA) deployments. Attended RDA requires a loop of human and bot interplay to complete tasks. These engagements are not the pure form of RPA that we invented – they are a motley crew of scripts and macros applying add band-aids to messy desktop applications and processes to maintain the same old way of doing things. Sure, there is usually a reduction in labor needs - but in fractional increments - which is rarely enough to justify entire headcount elimination. 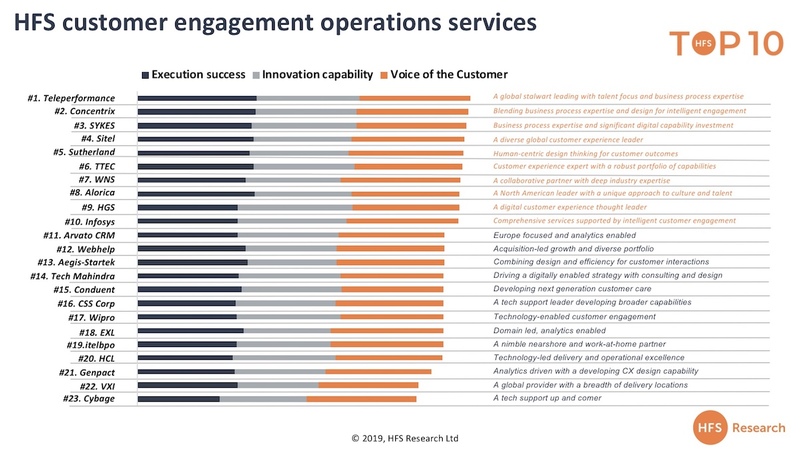 Crucially, the current plethora of “RPA” engagements have not resulted in any actual “transformation”. RPA products are seeking to underpin AI and data management capabilities. WorkFusion was arguably the first to combine RPA and AI with its “smart process automation” capability. 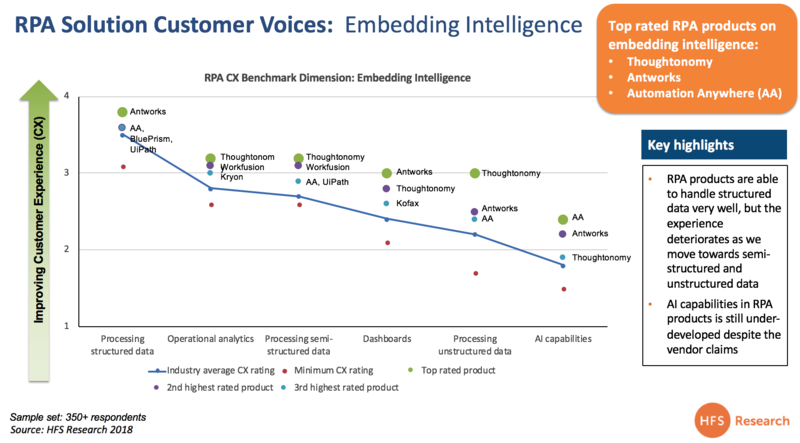 Other subsequent examples include Automation Anywhere with its ML-infused IQBot, Blue Prism announced its AI Lab to develop proprietary RPA-ready AI elements, and AntWorks embeds computer vision and fractal science in its stack to enable the use of unstructured data. What these products having in common is their use of robotics to transform tasks, desktop apps and pieces of processes. Hence, we need to refer to these "RPA" products as Robotic Transformation Software products which is a far more appropriate description. These are unique times for IT services - at the big-ticket end of the spectrum you have the mega-scale and competitive-cost propositions of the tier 1s vying for greater wallet share within their enterprise clients, while at the other, we have specific technical needs that warrant a lot of close attention that grabs the focus of the "mid-caps", which are much more flexible and can operate at smaller scale, while turning an attractive profit. Remember the good ol' hyper-growth days of IT services where the likes of Chandra (TCS), Frank (Cognizant), Nandan (Infosys) and Shiv (HCL) would fly around the world to close deals? Well, those days are long-gone as the top tier providers are simply too large and clients know they can't just pick up the phone to scream at the CEO anymore. In the last few years, Capgemini acquired IGATE and Atos acquired Syntel. 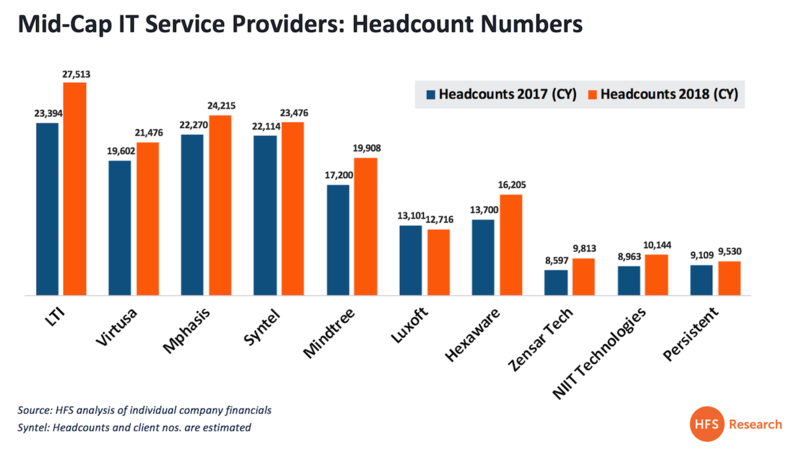 In both cases, the company being acquired was the leading mid-cap on the market, and both provided some crucial resources for European-centric service providers lacking strong Indian delivery capability. 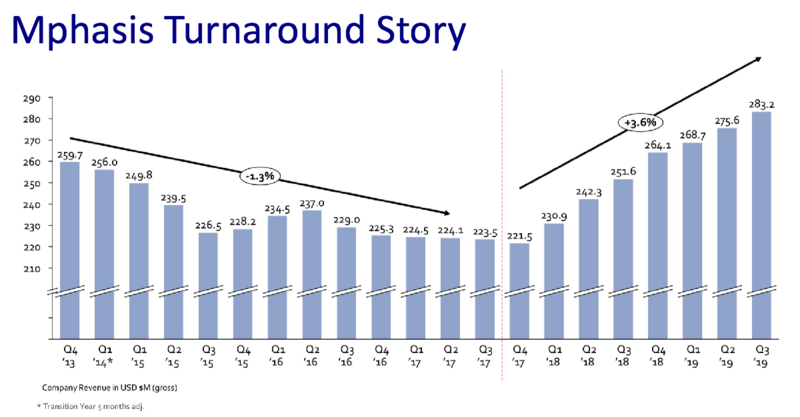 However, what transpired since has been the door opening for the next tranche to step up up - notably LTI, Virtusa and Mphasis - all of whom have blown past $1billion. 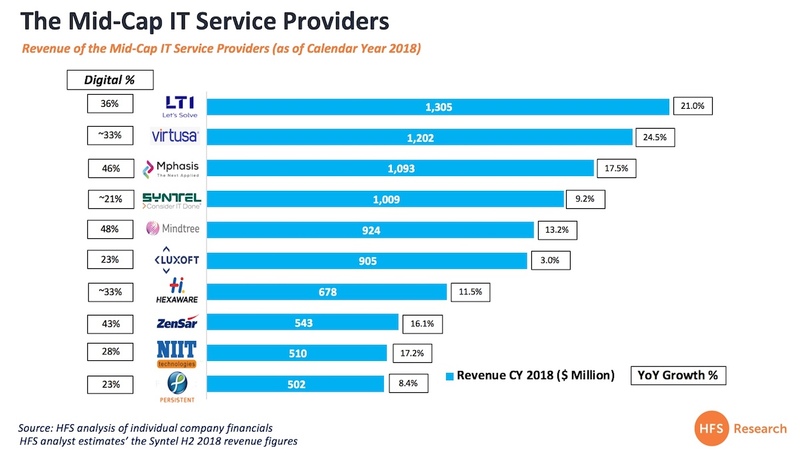 While LTI and Mindtree are embroiled in a less-than-friendly merger and Luxoft has already been bolted into the DXC empire, it would be of little surprise if any of the successful ones in this list are snapped up in the coming months as enterprises grapple with their needs for close attention to their creaking IT infrastructures and the dire need to develop agile capabilities, take better advantage of automation and AI tools... and find more sophisticated help to sort out their cloud messes. And as the latest ones are picked off, it's simply the time for the next wave to step into the void... firms like Zensar, NIIT and Hexaware are routinely discussed these days as strong providers in their own right, and are also potentially attractive acquisition targets, provided the fit is right(despite decades of heritage). These are the new rules of the services game... because the simple fact is that there are no rules and we're all writing new ones as the need for rapid, personalized IT salvation becomes more and more a critical part of the C-Suite agenda. If I have to listen to another technologist promoting “AI as a key component of the CIO’s agenda”, I am going to start getting a little irked… AI is not another app that can be installed and rolled out like a Workday, SAP or a ServiceNow. I even had to listen to an IT executive asking me whether he should “leave AI in the hands of SAP as part of their S4 upgrade”. Not only that, I noticed a well-known analyst firm promoting a webcast last week advising “CIOs how to rollout RPA”. The whole purpose of AI in the enterprise is to have business operations running as autonomously and intelligently as possible, which means we need to build enabling IT infrastructure that supports the business process logic and design. People are talking about “re-platforming the enterprise”… this is really about redesigning IT to support the business needs, to help the business respond to customer needs as soon they occur, and have the intelligence to anticipate the needs of their customers before its competitors can. I’m sorry to be mildly offensive here, but AI and automation are only effective when they are designed to solve process and business problems, not check another box on the CIO’s resume. While it is important to keep the IT team in the communication loop so that it is ready to provide the right infrastructure and technology stacks required for operationalizing AI solutions, the steering wheel of any business application of AI must be in the hands of the businesses. Smart businesses know their key pain areas and can identify the most relevant and feasible business cases. They own the data, they know the context, and how a process should run when it is augmented with appropriate AI techniques. 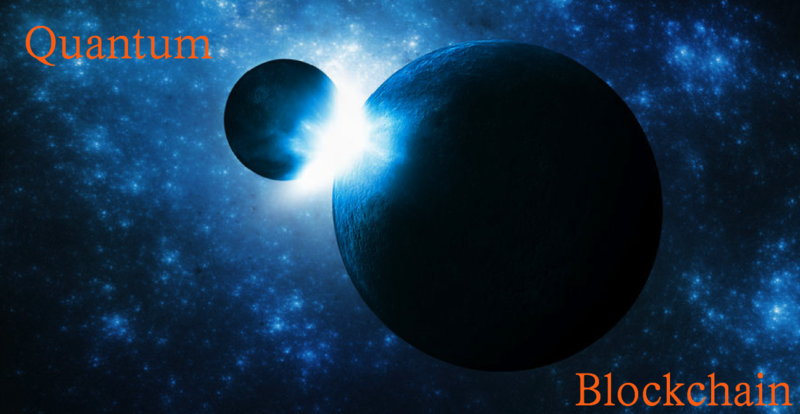 The reality is the ERP system of the last 3 decades is no longer the system of record for ambitious, hyperconnected enterprises. It is a rigid suite of standard processes that keep when wheels on a legacy operation. 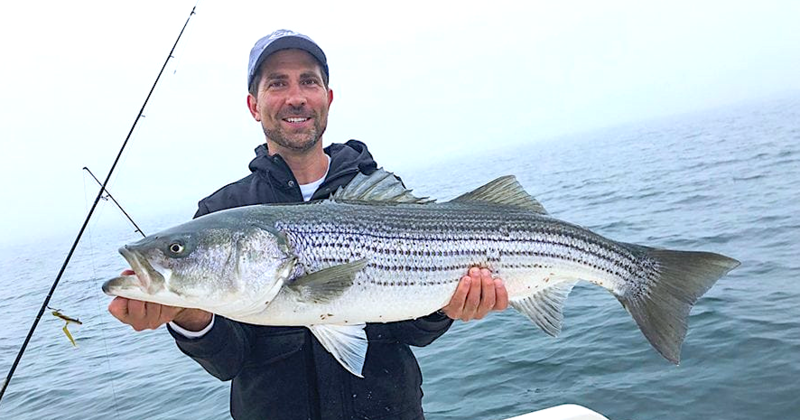 The emerging system of record is the data lake itself, when the business leaders have the ability to extract the data they need to make the right decisions, or have systems that can start to help make intelligent decisions for them. Prioritize use cases from AI technology availability. The business team must prioritize AI business use cases from the initially identified list of potential AI application opportunities. The team must demonstrate its process knowledge and desired end-state scenario to help the IT team to ensure effective project coordination and outcome-setting. Using external consultants at this phase can be very effective to ensure the best business/technology fit. Develop the AI Business case: The most critical step, where the business team must set initial benchmarks, define pre- and post-process improvement metrics, and estimate target benchmarks. AI Technology cost estimation: Developing estimates for the cost of technology stacks and solution deployment efforts must be the purview of business teams, but it requires significant and detailed input from the IT team. AI Data preparation and identification: Business teams must ensures success by identifying and preparing the data for training algorithms and building models. The team must solicit assistance from analytics and data warehousing teams. Coordinate with partners: During design phase of the target process model, the business team should must provide input to implementation partners (both internally and with their consultant/services partner) regarding ontology of the problem domain, the existing process models and rules. Teaming here with IT is essential, but the business team must define and communicate the business and process needs effectively. Manage effective AI feedback loops: To make use cases fir for production release, the business team must provide detailed, regular feedback on the accuracy and performance. Again, they need to work with implementation partners, which may be internal teams from an AI CoE or external partners. AI Training: The business team must be responsible for budgeting, planning and executing the training for large AI user teams, encompassing all of the staffing resources, external consultant costs, processes and task owners that are involved in the implemented use case. AI Deployment: Deployment doesn’t end once the use case is in production. The business team must continuously monitor the model’s outcomes, maintenance, and updates during the inferencing phase, and if the problem context changes with new rules or data, the team needs to add new dimensions and models and create new clusters. Users may also require retraining, especially as processes may change over time. There will also be the need to monitor change management issues, potential legal issues with data privacy / staffing impacts etc. The business team should seek help from IT in terms of infrastructure and tech stack needs, but it needs to own and run the AI projects because it owns the data, context, processes, and rules and understands the pain points. CIOs will face an existential fight if they don't start genuinely enabling the business. 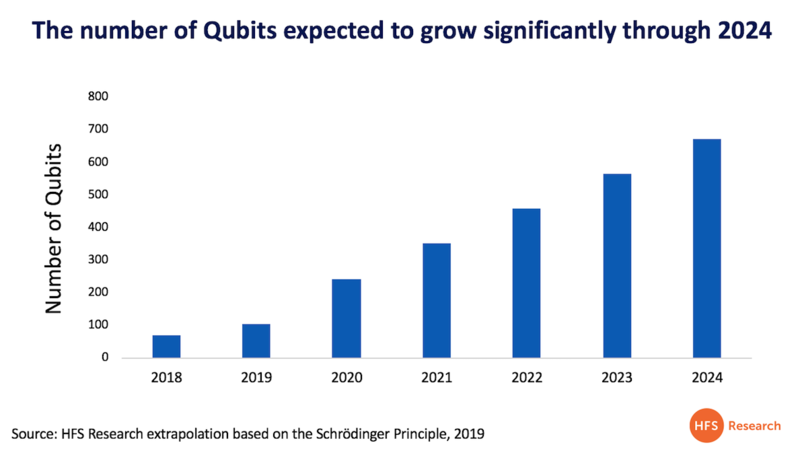 The world where IT was all about mitigating outages and avoiding risk is being replaced by one that demands speed, agility, and a genuine understanding of the business. Being tech-savvy isn't enough anymore… just knowing where to build a data center is pointless if you don't know what the rest of the business has planned. And this IT obsession of continually trying to upgrade ERP solutions, when most business units these days can handle it. That's the pitfall of the old traditional IT approach - we have to make sure we never get cemented in like that again. We really do not have to be this boring! The future is so exciting, we need to focus on our disruptive talent to make it all happen... just like the Blue-footed Booby!